We’ve got a mix of property right now, so before you start your search, it helps to put some thought into exactly what you’re looking for. Make a list of what’s important to you, including the essentials and the things that are just nice to have, and go from there. If you’re buying to let, think about what your tenants would like. For example, students might want somewhere central with easy access to local nightlife, while for a young family open space and good schools might be more important. If you’re buying a property, it’s likely you’ll own the place for a while, so location is doubly important. Do you want to be near work? In a leafy neighborhood or in Central London? Do you want local shops and restaurants? Are good schools important to you? Make a list of the postcodes or even streets that appeal to you and take time at a weekend to have a good look round the areas with flats and houses for sale. Getting around in your chosen area can be just as important as the area itself. Are you happy to travel some distance to work or do you want to walk? Do you need easy access to a tube or mainline station? If you travel out of London, do you need to be near a main road? When the right property comes along, you’ll want to be able to act immediately, so get your finances sorted out as soon as possible if required, have a mortgage agreed in principle. This will confirm how much money you can borrow to fund the purchase; this will ultimately affect your property search. Once you’ve sorted out your mortgage and you know the kind of flat or house in London you’re looking for, it’s time to get out there and find it. 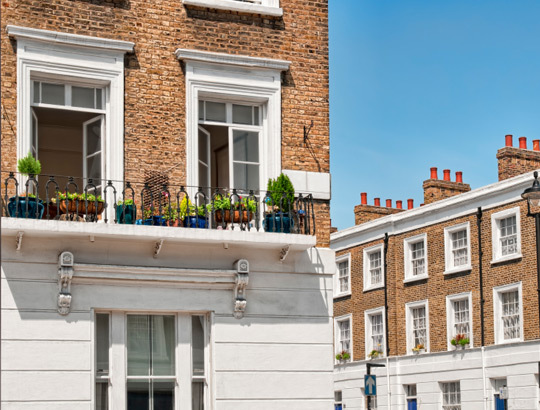 The first step to finding the right property is to register with us either by calling us on 020 7404 0039 or visiting us where you can discuss your property requirements with one of our experienced lettings negotiators. Once we know what you’re after, we’ll keep you updated by email. When we've found you a suitable flat or house in London, we’ll set up a viewing appointment as soon as possible. Tafaders will arrange viewings and accompany you to suitable properties that we currently have available ensuring you view in a relaxed frame of mind and be on hand to answer any questions immediately and advise where necessary. The successful purchase of a property can be reliant on the instruction of an efficient and experienced solicitor. It is a good idea to use a solicitor who knows the area that you're moving to and specialises in conveyancing. It is worth getting estimates from several conveyancers. Whichever conveyancer you decide to use, check that your lender is happy to use the same conveyancer for their legal work - this should help to keep the total legal costs you have to pay as low as possible. Some mortgage deals include free conveyancing up to a certain value, which can be useful if you want to minimise your upfront costs. We have a selection of tried and tested solicitors that are experts in property who we would be happy to recommend. Can you prove that you can afford to buy the property? It's a good idea to have a written agreement in principle from your mortgage lender. Can you move in time to suit the seller's timeframe? The sale of the property is not legally binding until exchange of contracts. Place the property on the market from ‘For Sale’ to ‘Sale Agreed/Under Offer’. You will now need to instruct your solicitor to proceed with the conveyancing process and contact your mortgage broker or lender to proceed with your application. Obtain the title deeds (documents giving evidence of ownership) of the property from the seller’s solicitor and examine them to make sure there are no problems and raise preliminary enquiries to the sellers solicitor. Make sure that you will get proper ownership of (title to) the property. Make sure that there are no planning conditions or particularly harsh conditions of ownership (for example an intrusive right of way) affecting the property. Make sure the seller has all planning permission and completion certificates for any alterations or extensions done to the property. Check that there are no local developments (for example, road-widening schemes, development or regeneration) planned which might affect the value of the property. Check that the street, pavement and main drains are public and maintained by the local authority. Negotiate and agree (with the seller’s solicitor) the draft of the contract setting out the terms on which you are buying. Register or record the change of title to the property, and the mortgage deed (loan agreement) in favour of the lender, with the Land Registry. We will assist both solicitors and negotiate throughout the conveyancing process, keeping you informed every step of the way. As the selling agent we will play a key role in assisting with the smooth flow of information between both parties leading up to exchange and completion. Before your mortgage lender approves your mortgage and makes an offer, the lender will want to identify any structural problems and check the property's value. To do this, the lender will usually arrange for a qualified surveyor to inspect the property. You normally have to pay for the valuation, even if you do not go on to buy the property. However, some lenders do not charge for valuations. Buying a home is a massive investment, so you might also want a homebuyer survey or building survey. This provides a far more detailed assessment of the condition of the property. Once your mortgage lender is happy, they’ll send your mortgage offer, including details of the terms, to you and to your solicitor. There are no legal obligations until contracts are signed. Once the conveyancing work has been completed the formal exchange of contracts can take place agreeing the terms of the sale and makes them legally binding on both you and the seller. Once signed by both parties the deposit (usually 10% of the purchase price) will be telegraphically transferred or paid in the form of a banker's draft from your solicitor to the seller's solicitor. The terms of the sale are now legally binding, which means that your deposit is non refundable if you change your mind. Equally, the seller is obliged to sell to you at the price you’ve agreed. On exchange the completion date is set by mutual agreement through your solicitor. Completion takes place when the residual monies (usually 90%), the remaining balance is transferred from your solicitor to the sellers solicitor’s account. The conveyancer is responsible for checking that the funds have been received before allowing the keys to be released to the new owner. Once you’ve had the call to confirm that the money has been transferred, the transfer document and title deeds will be yours. Often, in practice, it will be the seller or the estate agent who hands over the keys to you. Congratulations, you are now the legal owner of your new home!